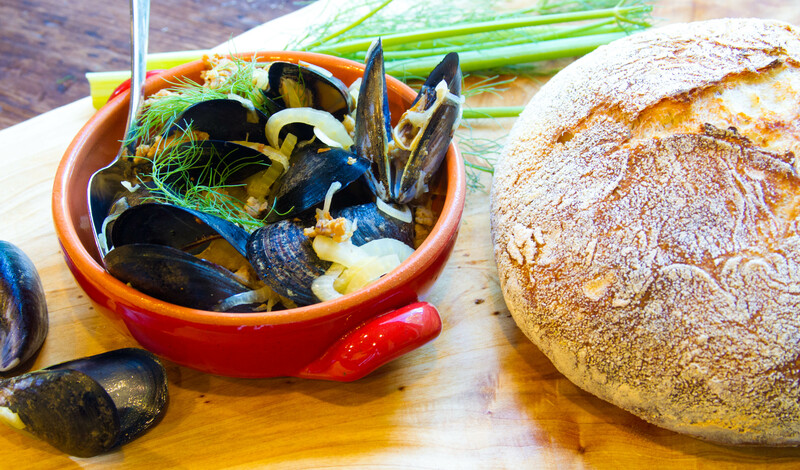 Mussels with Fennel, Italian Sausage and Créme Fraiche plus Rosemary Lemon Bread! I should be telling you about the steaming pot of mussels I cooked up yesterday. I should be telling you about the tender, sweet shellfish swimming in a broth of white wine, tangy créme fraiche and fennel. I should tell you about the little bits of hot italian sausage hiding in the mussel shells, like little yummy gifts waiting to be discovered. But, what is currently hijacking my brain right now is the crusty loaf of lemon rosemary bread that I used to dip into that tangy broth, sponging up all that goodness! That crusty, crackly crunchy shell hid an interior so creamy and custardy (hey that’s a lot of c-words in one sentence!) that I just need to take a moment to reflect on the wonder that is home-baked bread. Ok, now that I’ve gotten that out of my system, I can go back to telling you about those mussels! 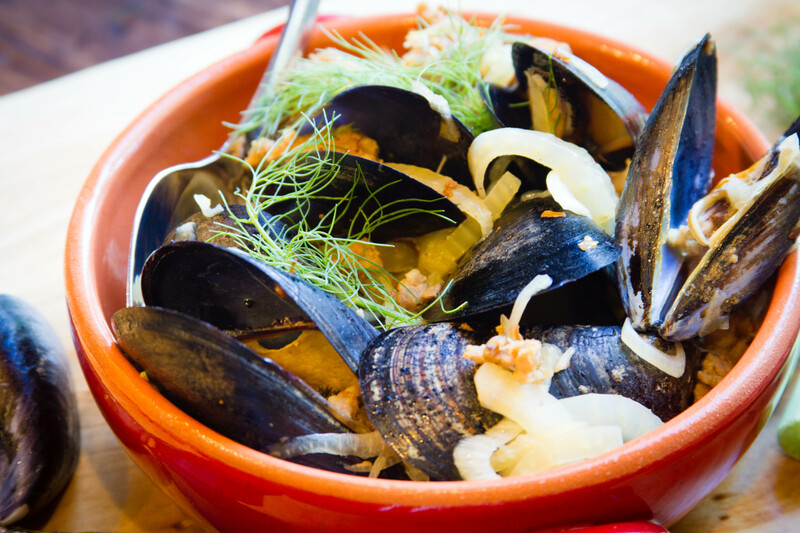 Cooking mussels in a broth of white wine is as classic as it comes, and this recipe takes that basic dish and amps it up with a bit of red chili flake, hot Italian sausage and fennel. 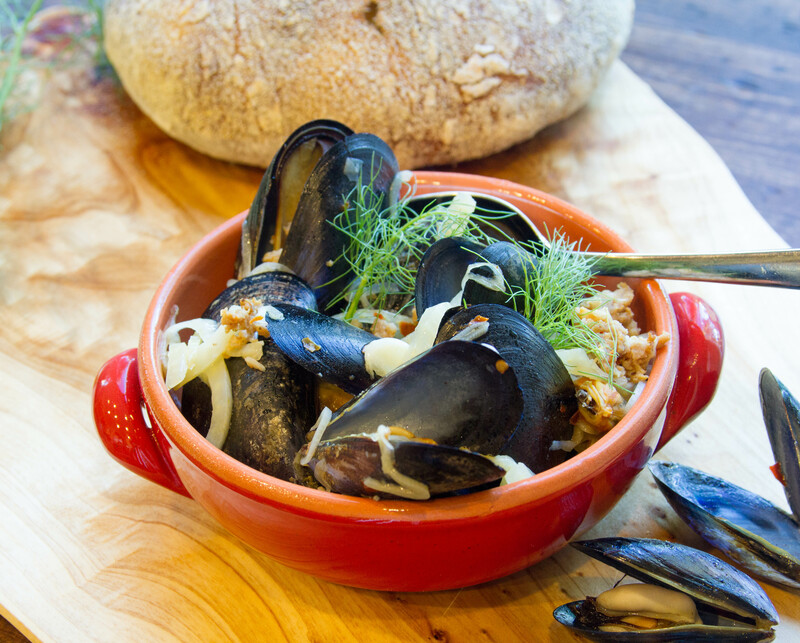 This is one of the first mussel recipes I learned to make and the original recipe is found in Jamie Oliver’s “Cook with Jamie”. Not too long ago, I found a similar recipe on the Food52 site that added Italian sausage to the mix. So, I have adapted the original recipe just a touch and came up with a recipe that blends the best of both versions. When you purchase mussels, make sure you get ones that are heavy and completely closed and smell fresh, like the ocean. They should not smell like ammonia or overly fishy. If they do, then they are not fresh. 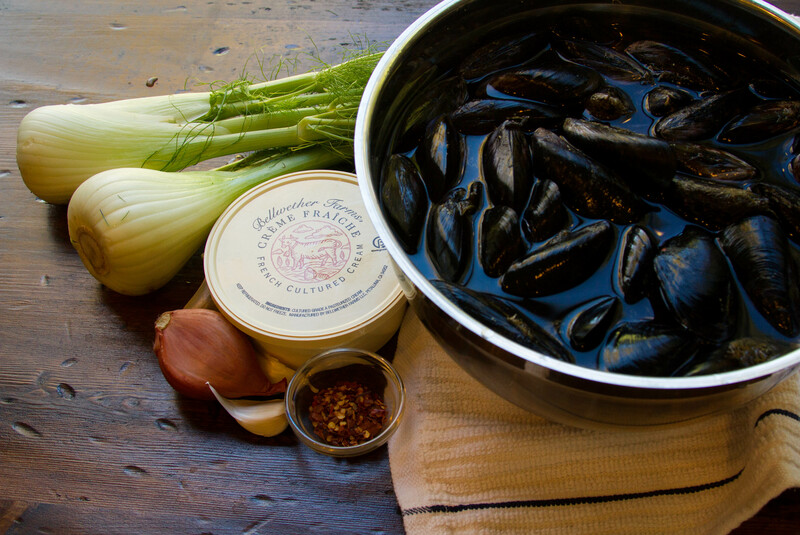 Bring your mussels home and immediately put them in a bowl and cover them with ice or a combination of ice and water. Whatever you do, take them out of the bag that you purchased them in and cook them as soon as possible. When you are ready to cook them, clean them under a stream of running water cleaning off any bits of dirt and beard that may remain on them. I used a pair of needle-nosed pliers to pull the beards off. The mussels I purchased were mostly de-bearded, but I still had to clean them up a bit. In a large skillet or saucepan, brown the Italian sausage. Remove the sausage and set aside. Add 2 tablespoons of extra virgin olive oil to the same pan and sauté the fennel, garlic and shallots for about 10 minutes or until the vegetables begin to caramelize. Remove the vegetables and set aside along with the sausage. On medium heat, add the saffron with the 2 tablespoons of water, the red chili flakes and the white wine. Bring to a boil, then add the mussels to the pan. Cover the pan and give the pan a good shake and continue cooking with the lid on. Check the mussels after 2 minutes. Depending on the size of the mussels they should begin to open in about 2 to 3 minutes. Discard any mussels that haven’t opened after 4 minutes of cooking. When all of the mussels have opened, remove the mussels from the pan (leaving the broth in the pan) and place them in a large bowl. Add the sausage and vegetables to the pan with the broth along with the créme fraiche and cook for 5 minutes. Taste the broth and add salt and pepper if needed. When the broth is seasoned to your liking, pour this broth over the mussels and serve immediately. So, onto that amazing bread! Full disclosure: this is not my first time making bread, but it was my first time making this particular recipe and technique. This bread is incredibly easy to make, but it takes a bit of time, so you can’t just decide on a whim to make it the same day. This bread rises for 12 to 18 hours on its initial rise and then an additional 2 hours on baking day, but let me tell you the results are worth the wait! There is very little hands-on activity–patience and time is what you need. 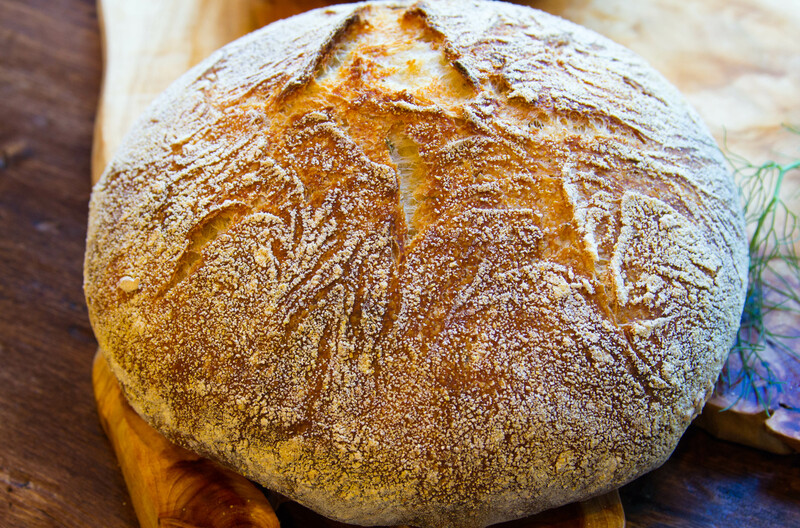 A lidded cast iron Dutch oven is the perfect implement with which to bake this bread. I started this bread around 8 pm and baked it the next day at 3 pm. Also, if your house is on the chilly side, it may take longer on the initial rise. The following morning, when it looked as if if hadn’t risen, I placed it in a slightly warmed (80 degree) oven for 4 hours and that did the trick. I used my stand mixer fitted with the paddle attachment to combine all of the ingredients and then allowed it to rest overnight in the mixing bowl. In a large bowl or in the bowl of a stand mixer, combine the flour, yeast, salt, lemon zest and rosemary. With the mixer on the lowest speed, slowly add 1 1/3 cups of water and mix until the ingredients are combined. The dough will look shaggy and will be very sticky. Cover the bowl with plastic wrap and place in a warm spot (around 70 degrees) for 12 to 18 hours or until the dough is dotted with small bubbles. Turn the dough out onto a lightly floured surface and sprinkle the surface with flour. Fold the dough onto itself. Imagine it like folding a towel. Fold in half lengthwise, then fold in half again cross-wise. Lightly cover the dough with plastic wrap and allow it to rest for 15 minutes. Now, quickly shape the dough into a ball by placing both hands on the dough and quickly pulling it towards you. Twist the dough a half-turn and pull it towards you again. Repeat until the dough is in a ball shape. Generously sprinkle a clean kitchen towel (not one made of terry cloth) with corn meal and place the dough ball (seam side down) on top of the corn meal. Sprinkle the top of the dough with additional flour and cover the dough with another clean kitchen towel. Allow the dough to rise for an additional 2 hours. About a half hour before the dough has completed its second rise, preheat your oven to 450 degrees and place the lidded cast iron Dutch oven inside. When the dough has completed its rise, remove the pot from the oven and remove the lid. Remove the top towel from the dough and slide your hand under the bottom towel. Plop the dough into the pot (seam side up), quickly place the lid on it and put it back in the hot oven. Bake for 30 minutes with the lid on. Then remove the lid and bake for 15 additional minutes. Remove the pot from the oven and allow the bread to rest for about 10 minutes. Then remove the bread and allow it to cool on a rack (or more realistically, tear into it while it’s still piping hot and shove it into your mouth). This all looks unbelievable! I am in awe of that bread…seriously, what a beautiful loaf! Can’t wait to try it, Tracey. Thank you so much Alexandra! That means so much coming from you because you are my baking hero! This was my best loaf yet! I still can’t believe we ate the whole thing in one day!